What’s the best dress to wear to a spring wedding? Should you wear white shoes after labor day? Is it still okay to wear opaque leggings under a short skirt? How do you untuck a dress shirt so it still looks dapper? These questions keep us up at night. (Okay–they don’t.) But there are more interesting fashion questions to ask yourself, you know, especially if you think you might be pulling together an outfit to fall a couple of miles out of an airplane. Skydiving in Georgia, after all, is a much more fashion-forward affair than skydiving in a less pulled-together state, non? 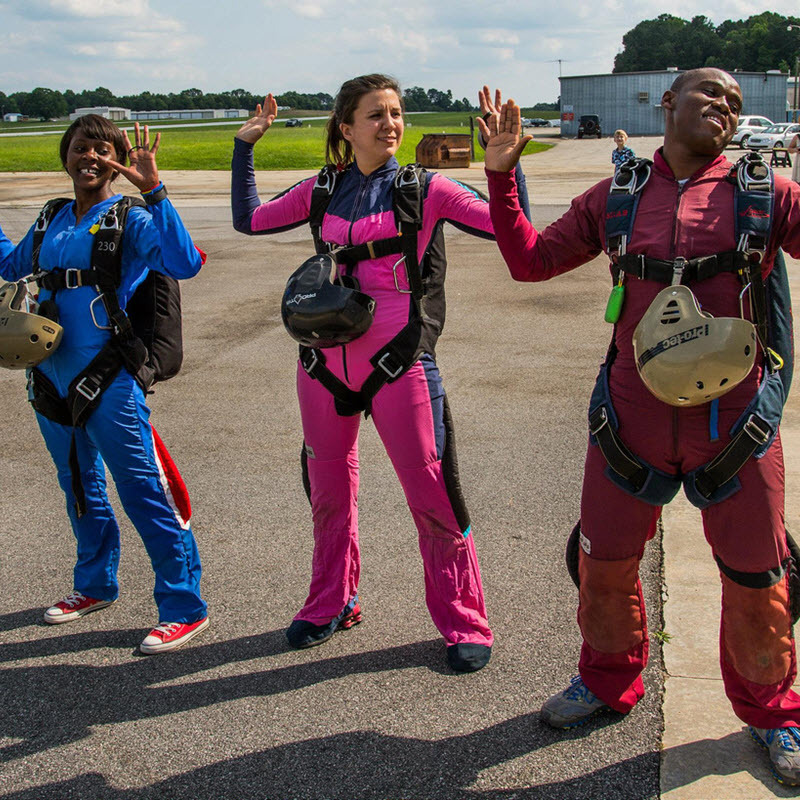 Even if you’re sporty-as, dressing for skydiving near Atlanta isn’t like any kind of outfit-planning you’ve ever done. The considerations are way different than any other sport we know of. Since you might not be familiar with the unique stresses that a skydive exerts on clothing–or how the conditions change from ground to air–we’ve put this little guide together to help. Here are our best tips on what to wear skydiving. Don’t worry–we’ll get you dressed for success! Here’s the formula: First, dress for the weather on the ground. Then add layers until you think you’ll be warm enough for temperatures thirty degrees cooler, ’cause that’s what it’ll be up there. Due to a phenomenon called “lapse rate,” the temperature at altitude is reliably about thirty degrees lower than the temperature on the ground. Even though you won’t be hanging around up there for more than a few minutes, you’ll be happy you prepared. After all, the differential can feel pretty significant even on a sunny summer day. On a chilly day, if you’re not prepared, it can be nasty. If you’re prepared, it won’t be a problem; you’ll just add on those chill-chasing layers when it’s your moment to hop in the plane. 2. Don’t be all puffy. The key, when choosing those layers, is to pick out close-fitting layers that move with your body. Fleece is generally a pretty solid fabric to choose, as it’s stretchy, warm and close-to-the-body. Choose layers that will fit nicely under the not-too-enormous jumpsuit we’ll borrow out to you. (Even if you decide not to wear it; if you don’t, close-fitting layers will catch less wind during freefall–which likes to grab every flappy bit of fabric it can find and yank it around like a very big, very playful puppy. Sensible shoes are an absolute must for skydiving. Even though you may have seen Roberta Mancino wearing heels for a jump or two, here’s a trade secret: she always kicks them off before she lands! To nail this part of the wardrobe planning, you should pick out shoes that lace up securely and that you wouldn’t mind going for a fifty-foot sprint in. That litmus test will ensure that you’re wearing shoes that will stay on your feet when they’re kicking around in freefall. 4. Plan for a grass stain or two. We provide jumpsuits to protect your clothes from the imminent kiss of the landing-area grass. Because it’s the safest way, most tandem skydivers will be instructed in for a landing that concludes softly upon their cushiony tookis. That should make it obvious that you shouldn’t wear your favorite white linen suit, Dr. Livingstone. 5. Accessorizing with eyewear? Go for it. Seeing what’s going on up there is so important to your enjoyment of your jump. (Duh!) We’ll provide you with the goggles you need to protect whatever vision correction you’re sporting, whether that be glasses, contacts or a piratey eye patch. We have you covered. Got specific questions? Costume ideas? Clarifications? Reach out to us. We’ll be more than happy to help!